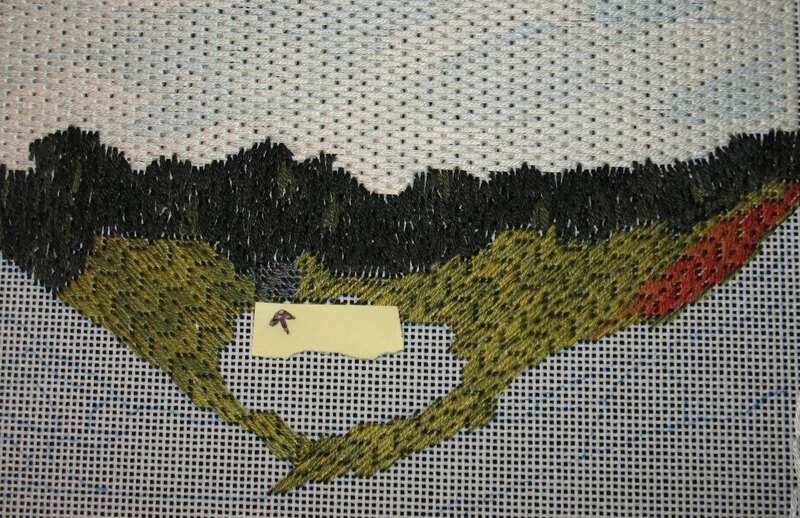 In the 3 very dark green grassy areas, I wanted to use different but related stitches. 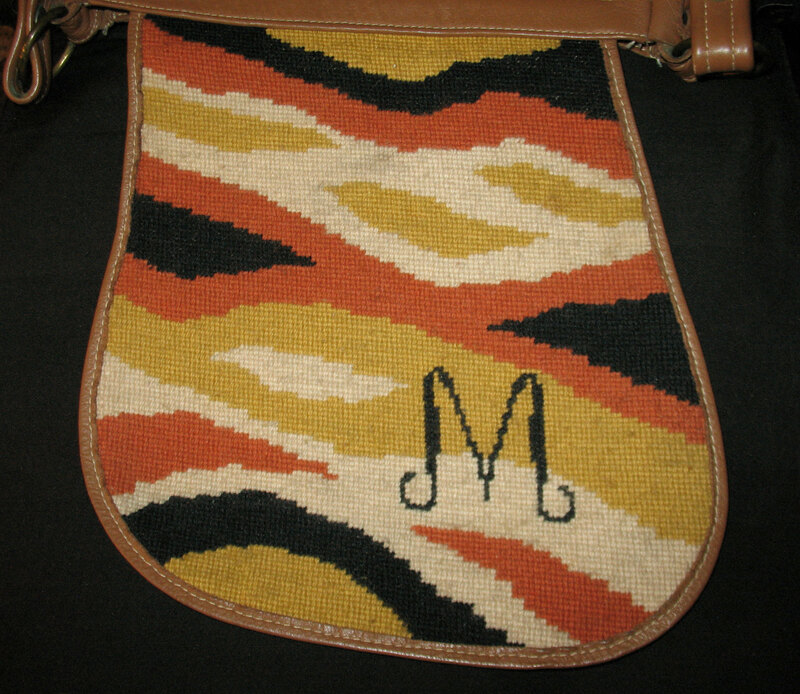 So, I selected Criss Cross Hungarian for the left patch because of the denseness of the stitch & the longer length. 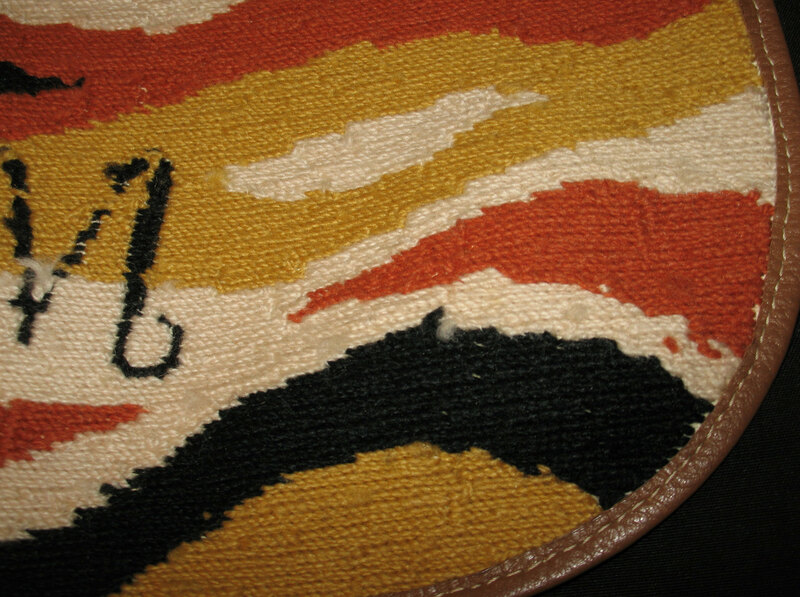 The Woven Trellis is in the center patch because it is about as long a stitch as the left patch and because they are on about the same distance. And, Serendipity was selected for the right patch because it is farther away than the other 2 areas and is a smaller stitch. The darker the thread (still using Sampler Threads 7042 Raven) the less of a stitch pattern is evident but up close you can see the differences. For the top long row, I used the 3 threads layed in the same direction to get a few patches of light green from the overdyed. But, in the smaller 3 areas, I layed 1 in the opposite direction for a more solid dark effect. In case you forget what Monet’s look like by now, here part of it is again. 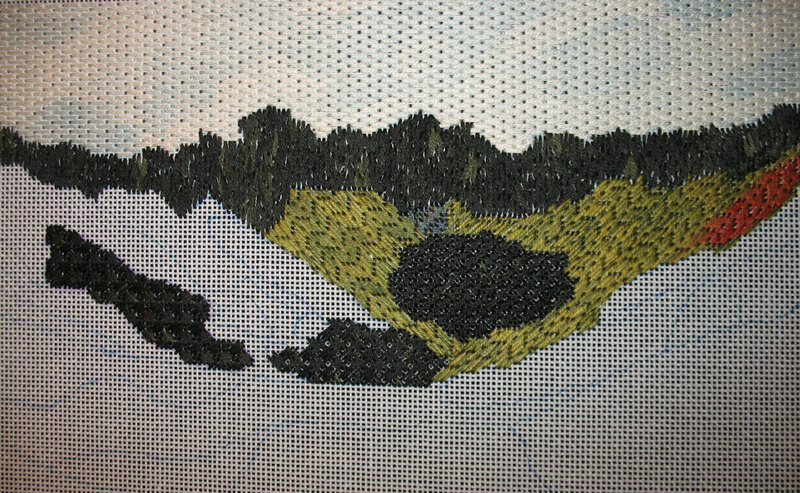 For the large medium dark green grass area, I used one strand each of Weeks Dye Works overdyes named Grasshopper (yellow-green), Collards (dark green), and Moss (medium green). The stitch, Diane’s Lace from Suzy’s Portable Stitches, was difficult to get the hang of but especially slanting up & to the right (on the left side). The other angle, slanting up & to the left, just clicked for me. Odd how the brain sees some things better than other. 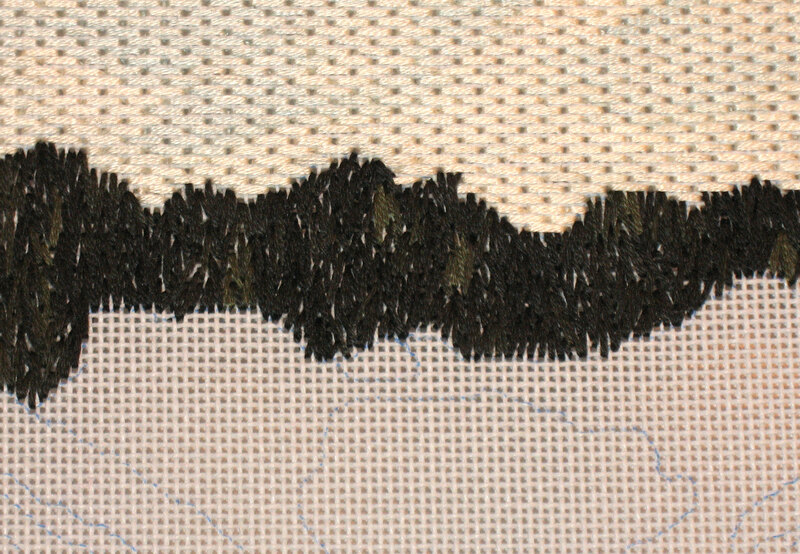 It’s a good stitch for full coverage & looks somewhat random (especially using overdyed floss). 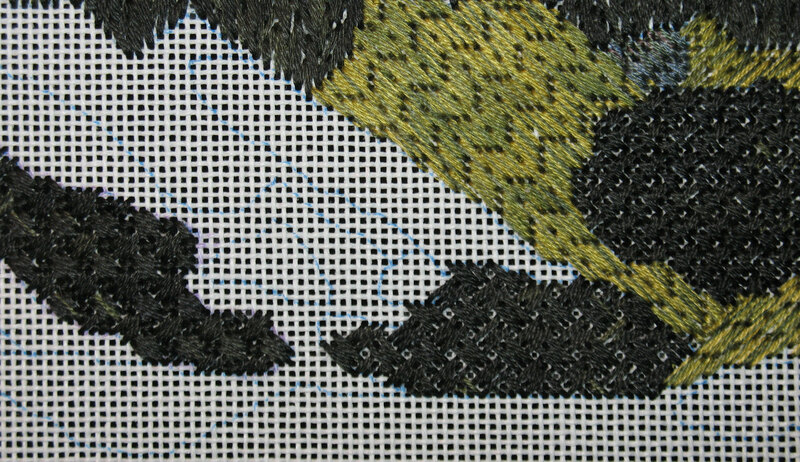 The little dark blue-green area in the center (with arrow pointed to it) used a portion of the 2 threads with the blue portion and 1 thread with the green portion in an encroaching gobelin stitch. 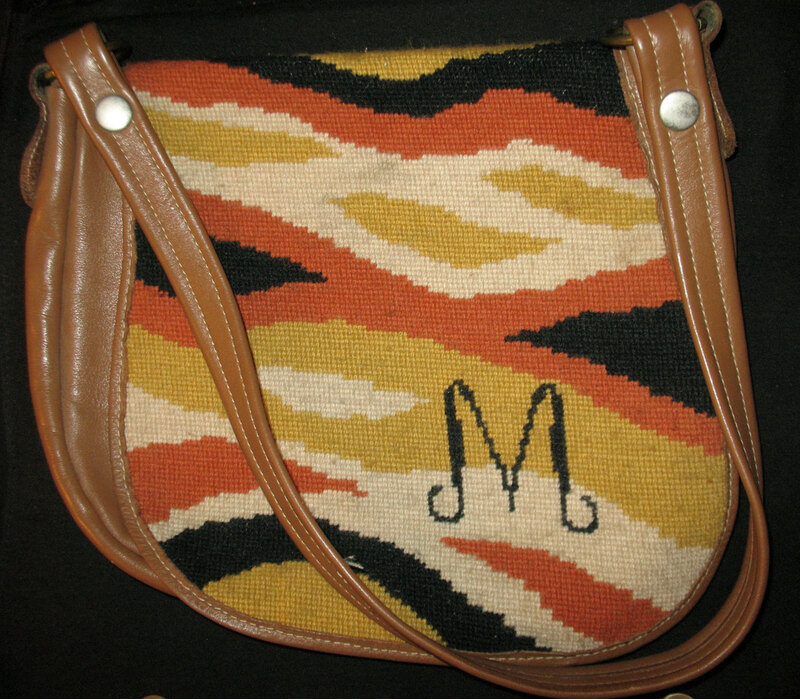 Did some spring cleaning today in the closet & found this purse that I did in the 70s for myself. I used it a lot then. It probably was a kit but don’t know from where. I stitched it using continental & that caused the misalignment. I should have used the tent stitch! The far dark green section is done using random straight stitches & Weeks Dye Works (WDW) thread (color named Raven) that is very dark with portions of a slightly lighter green. I like that a little canvas shows through – especially up close as it seems more natural. And, I removed what green & orange threads I had placed in the upper right area from stitching in class because I found more shades of WDW. I plan on doing a lot of thread blending with what I found (but more of that with my next blog). http://www.weeksdyeworks.com/index.php (great overdyed floss selection that I was able to get at The Strawberry Sampler in Glen Mills, PA which is southwest of Philadelphia & not too far). No financial interest . . . I just love that the whole country gets the day off for the wedding! Actually they have a 4-day weekend. I’ve been catching up on my TV this weekend, including the Royal Wedding! Beautiful event, the dress was incredible. I heard that the people doing the hand sewing had to wash their hands every 30 minutes! We should probably take note of that practice.